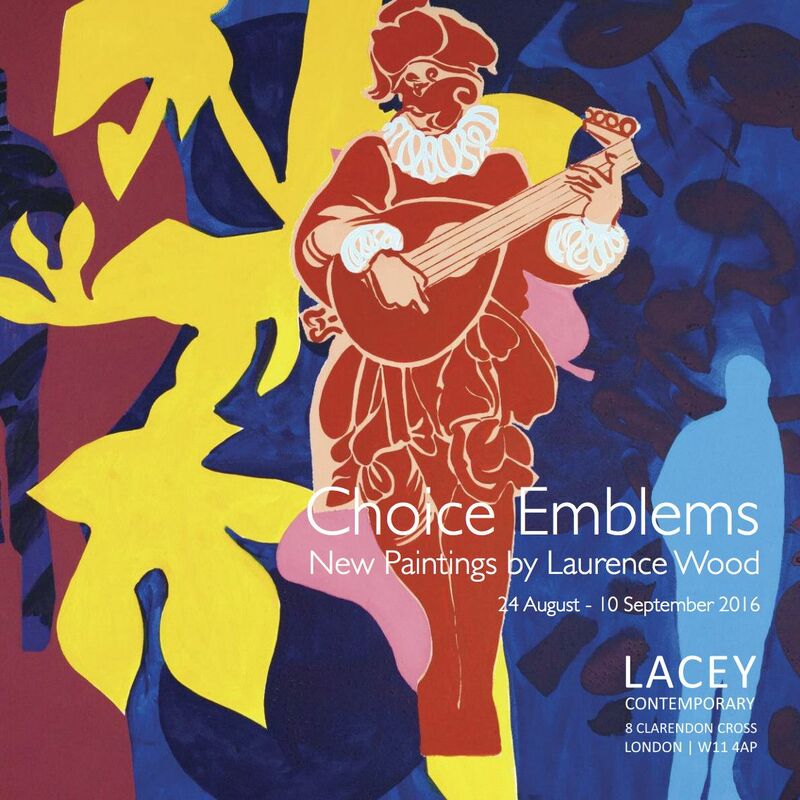 Lacey Contemporary Gallery is proud to present Laurence Wood in his second solo exhibition with the gallery, “Choice Emblems”. Wood’s emblems are diverse. Some are naturalistic, and some not, some are cryptic whilst others are direct. You will find images of egrets, a lute player, chickens, refugees, my little pony, and a peacock cocktail fan assembled in this show. The paintings’ titles operate like the mottos or ‘subscriptione’ found alongside the ‘Pictura’ of medieval emblem books, and invite the viewer to consider particular, though not exclusive, decodings of the paintings. There are complex interplays in the work which viewers can explore at their own pace. Alongside the initial impact that these paintings have they can also sustain much re-visiting and reflection. They are bright and intense and as seen in his previous exhibition at Lacey ‘Around, Amongst, Within, Wood continues to exploit and celebrate his painterly juxtaposition of picture plane flatness against spatial illusion, figurative depiction against emotional gesture, and topographical observation combined with spontaneous invention. Laurence Wood graduated from the Royal College of Art in 1985. His creative journey has included work as a saxophonist with 2-tone band The Apollinaires and with Champion Doug Vietch, and as a published writer and illustrator. His paintings are included in both public and private collections including His Royal Highness, The Prince of Wales collection at Highgrove, the National Trust Foundation for Art, the Royal College of Art, London, and the HSBC Bank HQ, Canary Wharf, London. In 2015 he completed two commissioned paintings for the Kent Science Park. Laurence has exhibited extensively in the UK, Europe and in Asia and was a painting finalist in the 8th Artelaguna International Art Prize in Venice, Italy in 2014. Laurence is currently living and working in Hong Kong where he holds a Professorship in the Department of Cultural and Creative Arts at the Education University of Hong Kong. This year he has exhibited video works as part of a collaborative video art/music project at the Black Box Theatre in Kowloon, and with the Videotage gallery at Art Basel, Hong Kong. In May he was invited to exhibit a new painting in The Monochrome Show, Spice Select at Nadine Fine Art SE Asia in Kuala Lumpur, Malaysia.